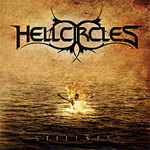 Hellcircles, metal newcomers from Cremona Italy, have premiered with an ambitious debut in Stillness. Don't be fooled by the album. Formed around Marco Parisi (v,k) and Roberto Fornaroli (g) in late 2008, Hellcircles' music is aggressive power metal which sacrifices neither melody or creativity. I'm not sure I would call this brief disc progressive power metal although the arrangements offer better than average versatility and inspiration. The pace is quick, the riffs heavy and mighty throughout even as they are wrapped up in strong melodies and unexpected and clever vocal arrangements. The latter, however, may prove difficult to digest at first. When left by himself on lead, Parisi can slide between incomprehensible and adequate. Hellcircles may do well to enlist a dedicated lead vocalist. With this said, the strength of Stillness is in the rather impressive and well developed songs. Yet all the songs depend heavily on the galloping power metal motif. It would have been nice to have some pause or variation from this relentlessness. Hopefully, Hellcircles has more music up their sleeves for a full album to remedy this. Hellcircles debut Stillness is a strong measure of melodic, yet aggressive, power metal which shows creative songwriting, skillful musicianship, and above all, some honest promise for an exciting future. Recommended!